The fundamental imperative is to achieve the objective of the UNFCCC or 'UNFCCC-compliance'. This recognises that to survive, we must avoid emissions-driven acceleration of GHG concentration in the atmosphere, temperature rise [global warming] and the already dangerously accelerating rates of potentially runaway climate change. 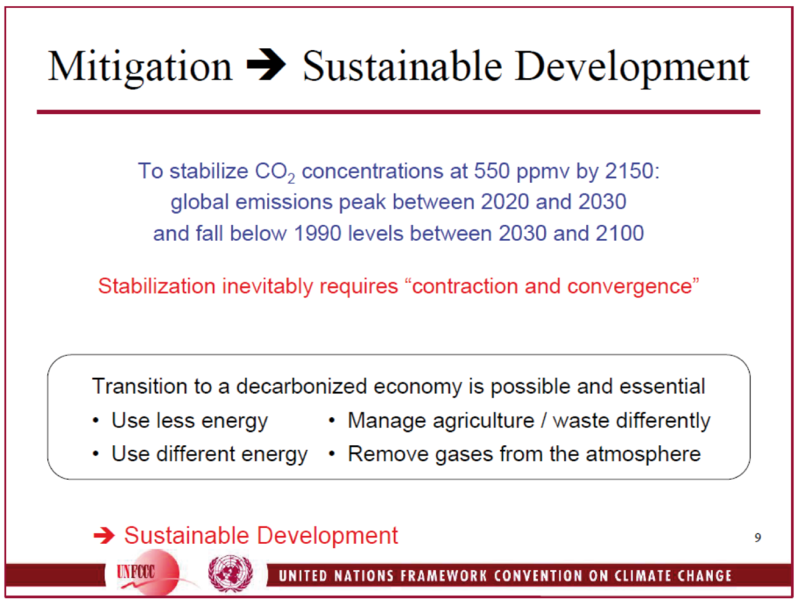 The UNFCCC executive stated in 2004 that Contraction and Convergence [C&C] is "inevitably required" for UNFCCC-compliance. More recently climate sceptics in the USA have taken the position that "the UNFCCC embeds the C&C principle" & "C&C is UN Policy." The key is to 'do-enough soon-enough' as we are on the clock now. Responding to a recent Guardian article, designer Marie Loh focused on the C&C proposal saying, "I believe C&C holds the answer for sustainability, forcing design innovation"
This helps to take the argument forward. It follows a decade of debate as to whether C&C was loaded with a 'contestable assumption' or simply an 'incontestable truth'. As a result, discussions and markets for sustainability and UNFCCC-compliance and the 'design innovation' tending all those, were sent to limbo by that unresolved argument. This debate started in Whitehall, where it had been declared of C&C that, "Any conceivable solution involves [at least crude] C&C, yet at its heart lurks a contestable ideological assumption." Answering this in 2007, the All-Party Parliamentary Climate Change Group [APPCCG] named C&C, "The Incontestable Truth" and distributed a CD of that name to over 600 MPs, explaining why that was so. Contestable or not, C&C is now recognized as the basis of the 2008 UK Climate Act. So when civil servants asserting C&C's,"contestable ideological assumptions" are answered by an economist's recognition of the complexity created by, "contestable economic computations" super-imposed on C&C by economists, the civil servants' projection are trumped. Professor Garnaut is right, as economic computations are by definition contestable and generate a contestability that UK civil servants have tried to retrovert on to C&C under the flag of contestable ideological assumptions. In reality this is a white flag and they have hidden behind it for a decade. At a public meeting in 2008, Peter Greaves a journalist for the UNA, asked Hilary Benn [the then Minister at DEFRA] why C&C was not in the Climate Act. Benn apparently retorted that the C&C concept was mathematically complex and while it was all very well for the long term, "we have to do it in bits." Peter Greaves observed, "There may be ingenious mathematical projections in its development, but the basic concept could not be more simple: as Milton put it, "an equal and beseeming share." The Bill should – in my opinion – begin with a firm commitment in principle to the concept of C&C, so that we all (in this and other countries) know where we are heading, and then set out some of "the bits" with which we will start the process. There is not the slightest prospect that developing countries will agree to control their emissions until they see that rich countries – and we claim to be a leader - start to contract their own." That was a clear and sensible statement. It came in conjunction with the statement that in fact C&C 'lurks at the heart of any conceivable solution,' as the UK Climate Act more than amply demonstrates. Indeed, as Chairman of the Government's Climate Change Committee [CCC], Adair Turner gave evidence to the House of Commons Environmental Audit Committe [EAC] in early 2009. Interrogated by Joan Wally MP, the evidence is very telling. When she presses him on Peter Greaves' very points, Adair Turner concedes to the EAC that the the Climate Act is in fact C&C. While elsewhere CCC bureaucrats insist that it is not, others like IMechE for example insist that it is. There are two headline reasons why this 'resistance to the incontestability of C&C' is still offered. The first attaches to those who tend to assert that there isn't really a climate change problem at all. So as far as they are concerned, its the problem that's really contestable not the solution. The second attaches to those, typically in Whitehall, who assert that there is a climate change problem, but that C&C is not 'an input' to the negotiations to solve it, so much as merely an 'output' Typically Tom Burke of 'E3G' argues this way, saying that C&C is merely the result of, rather than the cause of, whatever happens in the negotiations at the UNFCCC. This makes him a 'solution-denier' rather than a 'problem-denier'. If the first case were true, the UNFCCC wouldn't exist; but sadly, there is a problem and the UNFCCC does exist and we do need to achieve UNFCCC-compliance. If the second were true, there would be some evidence to support it. Indeed, after twenty years of negotiations, the opposite is true and overall we continue to behave as if there isn't a problem. However, after twenty year of negotiating as if there is, we are now causing the problem even faster than we were responding to avoid it 20 years ago. The evidence of rising concentrations of GHG & rising temperature keeps coming in. Those who still behave as though there is evidence to support the position that 'C&C is not input, it is only output', blank the fundamental tension that has created the stand-off that has dead-locked the negotiations for the twenty years that they have run. It is over the massive structural inequity we have created globally over the last 500 years and the Expansion and Divergence that we have locked in since fossil-fuel use replaced slavery less than 200 years ago. This avoidance has given birth to the ideology of 'market-randomness', 'growth' and the resultant 'short-term, local little-bitsiness' of their so-called 'market-based-framework' to respond to climate change. Efforts by the idealogues to make C&C seem 'ideological' - rather than simply be what it is, which is a 'logical' 'framework-based-market' - means that they now have more in common with Baron von Munchausen than those who actually deny there is a problem. The problem-denier group, contest the evidence and mounted on mules, merely tilts at windmills. The windmills stand but as the road lengthens and the evidence of warming keeps coming in, the mules grow weary. However, the solution-denier group, have a truly 'tall-story'. They insist on the 'pragmatism' of only 'doing it in bits', and already they hang with their horses from the domes high above Moscow as the ice and snows melt, incredulous as to how they have come to be there at all. All that is really contestable or not is whether we will achieve UNFCCC-compliance. As the climate-sceptic Richard Lindzen said, "C&C is obvious; I just don't think humanity has the wit to organize it" and he may be right. We have a simple choice and by choosing to stick with randomness and avoidance, will we now make the choice that finally destroys us? The organising principle of C&C is true whatever C&C rates are computed. And it is essential that the different rates of applying the C&C principle in this structured way are openly considered in the assessment of our 'global' problem and the negotiation of its 'solution'. This should happen in advance of all the agreements that are made to implement the agreement for UNFCCC-compliance. If not, the organising principle is submerged in the 'contestable ideological assumptions' and the 'contestable economic computations' of business-as-usual, in a way where the framework is suppressed in favour of the the guesswork that makes effective negotiation for UNFCCC-compliance impossible and the disaster of overall failure increasingly inevitable. The rates of C&C needed for UNFCCC-compliance are those governed by the benefit of decarbonizing at a rate which is faster than the current growth-rate of climate damage costs [6%/year: Munich-Re]. The issue is not short-term versus the long-term. The issue is full-term and its shorter than we think. 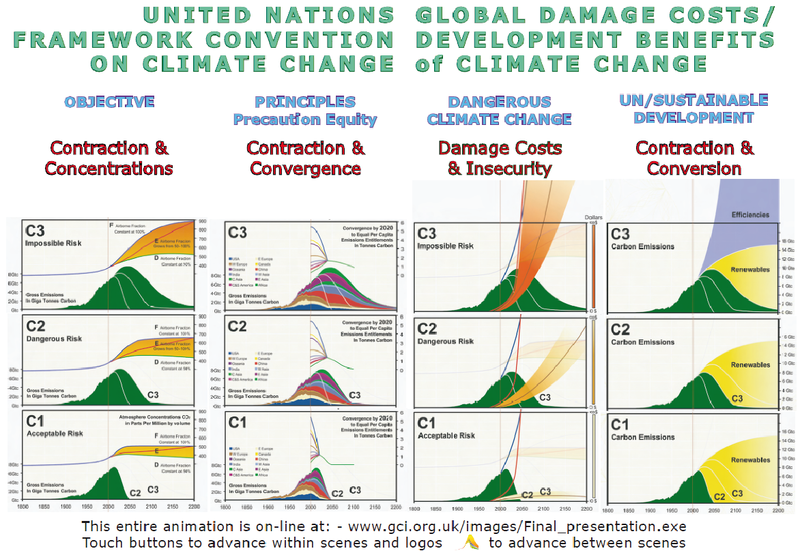 In 2012 it is generally accepted that the C1 Scenario is needed to keep within the '2 degrees' threshold. Testing for the Truth of C&C - Is C&C a 'Contestable' or an 'Incontestable' Truth? Like this, the full-term logic of C&C time-space is incontestable. Random "ideological assumptions" & short-term "economic computations" put in the way of C&C are entirely contestable.